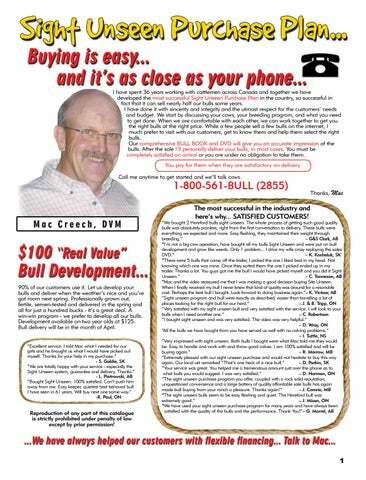 I have spent 36 years working with cattlemen across Canada and together we have developed the most successful Sight Unseen Purchase Plan in the country, so successful in fact that it can sell nearly half our bulls some years. I have done it with sincerity and integrity and the utmost respect for the customers’ needs and budget. We start by discussing your cows, your breeding program, and what you need to get done. When we are comfortable with each other, we can work together to get you the right bulls at the right price. While a few people sell a few bulls on the internet, I much prefer to visit with our customers, get to know them and help them select the right bulls. Our comprehensive BULL BOOK and DVD will give you an accurate impression of the bulls. After the sale I’ll personally deliver your bulls, in most cases. You must be completely satisfied on arrival or you are under no obligation to take them. You pay for them when they are satisfactory on delivery. Call me anytime to get started and we’ll talk cows. 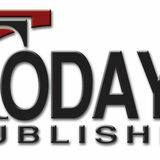 The most successful in the industry and here’s why... SATISFIED CUSTOMERS! Reproduction of any part of this catalogue is strictly prohibited under penalty of law except by prior permission!